The Fire Marshal of the Year award honors an individual that has demonstrated a commitment to reduce losses associated with fire and other hazards through progressive leadership, dedication and valuable contributions to the field of fire prevention and life safety. The creation of Miramar FD radio, an educational delivery methodology in which our reach to the community has increased exponentially. The initiatives have been surgically strategic and have not only increased the productivity and efficiency of the department, but have been accomplished in a fiscally responsible manner reducing cost and relieving the service impact on the general fund. During his long career in the fire service, Chief Perez has been a major contributor to the operations of multiple divisions to include: EMS, Training, Special Operations Risk Mitigation, Administration, and the Fire Life Safety Bureau as its Fire Marshal, responsible for all aspects of emergency service delivery. During his 30 year tenure in the fire service, he has received multiple accolades to include, the Life Saving Award, and multiple commendations for meritorious service. A firm believer in education, Chief Perez holds a Master’s in Business Administration as well as Finance, Leadership and Strategic Management. His undergraduate studies are confirmed in all facets related to the fire service and emergency medical services. He is a nationally certified Fire and Explosion investigator, Paramedic and Registered Nurse, and holds multiple certified instructor ratings such as, Fire Service Instructor, Hazardous Material Instructor, Public Safety Dive Instructor, Law Enforcement Firearm and defensive tactics instructor and numerous others. He maintains active membership in numerous professional and trade organizations and has served as past President and Vice President of the Miami Dade Fire Chiefs Association as well as President of the Dade County Fire Marshals subcommittee. Chief Perez’s professional achievements are numerous and distinguished. 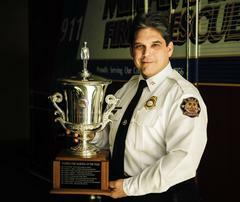 “He is truly deserving of this recognition, and he proudly represents our city” L. Keith Tomey, III, Fire-Rescue Chief.